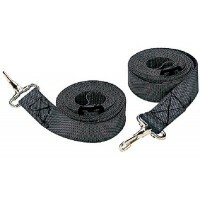 KIt includes: 1" Black polypropylene webbing, stainless steel hooks, footman loops, screws and plast..
1" black polypropylene webbing with heavy nickel plated brass snap hook and stainless steel adjustab..
Gator Tuff strap! 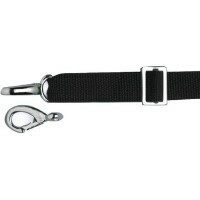 Eight foot bimini top strap with 1" webbing, adjustment buckle, plated dog snap. P..
Chrome plated zinc. 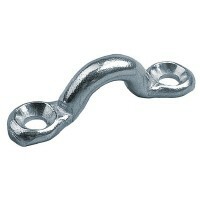 Card: 5Size: 1-7/8" L x 5/16" ID EyeFastener: #8..
Chrome plated zinc. 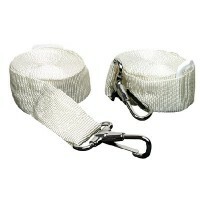 Card: 100Size: 1-7/8" L x 5/16" ID EyeFastener: #8..
Nylon webbing. 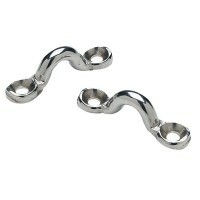 Stainless chrome plated brass. 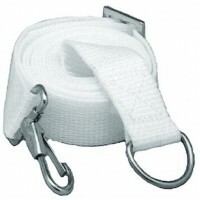 Card: 1 prSize: 1" x 8'Color: White..
Nylon webbing. 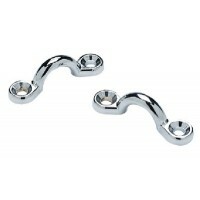 Stainless chrome plated brass. Card: 1 prSize: 1" x 8'Color: Black..
Chrome zinc pad eye-3/8 inch Card: 5A: 3/8"Fastener: #8FHB: 1/2"C: 1-3/8"Description: CP Zinc..
Injection molded nylon. 2735681 has a 1/4-28 x 3/4" thread size. Card: 1 PRSize: 1/4" x 1-3/8"Descri..
Injection molded nylon. 2735681 has a 1/4-28 x 3/4" thread size. Card: 1 PRSize: 2-1/16" x 3/4"Descr..
Nylon pad eye - 3/8 inch (blac Card: 5A: 3/8"Fastener: #8FHB: 1/2"C: 1-3/8"Description: Black Nylon.. 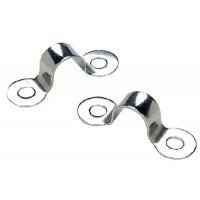 Eye strap 4 Card: 5A: 3/8"Fastener: #8FHB: 1/2"C: 1-3/8"Description: White Nylon..
304 stainless steel. 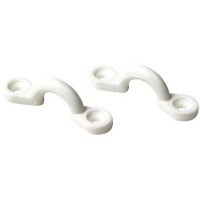 Card: 2A: 5/16"Fastener: #8 FHB: 3/8"C: 1-3/8..
Injection molded nylon. 2735681 has a 1/4-28 x 3/4" thread size. Card: 1 PRSize: 2-3/8" x 1"Descript..
Injection molded nylon. 2735681 has a 1/4-28 x 3/4" thread size. 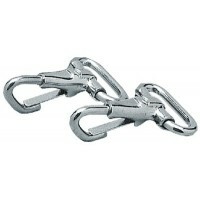 Card: 1 PRSize: 6" x 1"Description:..
304 stainless steel. 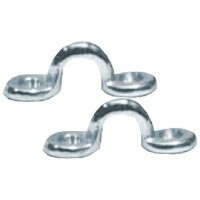 Card: BulkA: 5/16"Fastener: #8 FHB: 3/8"C: 1-3/8..
Injection molded nylon. Fits 7/8" tubing. Card: 1 Pr.Size: 2-1/4" L x 7/8" ODColor: Black..
1" nylon webbing. 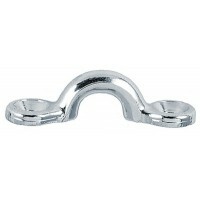 Ring, snap, and buckle are corrosion resistant. Great for most size Biminis and aw.. Multitude of applications. 28841: Use as battery hold down. Card: 4Size: 1-7/8" L x 11/32" ID EyeFas.. Multitude of applications. 28841: Use as battery hold down. Card: 4Size: 1-7/8" L x 3/8" ID EyeFaste.. Multitude of applications. 28841: Use as battery hold down. Card: 2Size: 2-11/16" L x 11/32" x 1-7/3..
Spring snap-cpb-(2/pk) Eye: 1/4"Size: 2-1/8" LID: 1".. Multitude of applications. 28841: Use as battery hold down. Card: 2Size: 1-5/8" L x 3/8" ID EyeFaste.. 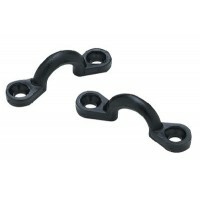 Provides in one convenient package, all of the Ball & Socket deck hinges, top caps, and jaw slides n..
Black nylon pad eye Size: 3/16" eyeColor: Black..
Fitted with ring at one end and a snap on the other. 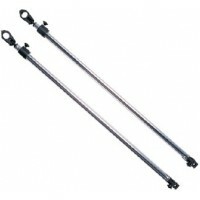 Great for securing biminis and awnings. Bag: 1 .. 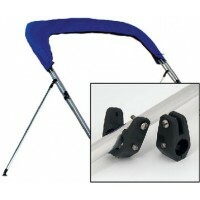 Protect your clear windows from sun burn, cracking, fading and browning out from contact with hot bi..
Keep your bimini top off the gunwales with a pair of bimini support poles. These poles replace your ..
Comes complete with screws. 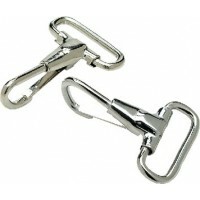 Card: 2Size: 1-1/2" L x 5/16" ID EyeDescription: Chromed Zamak..
1" stainless steel snap. Card: 1 pr..